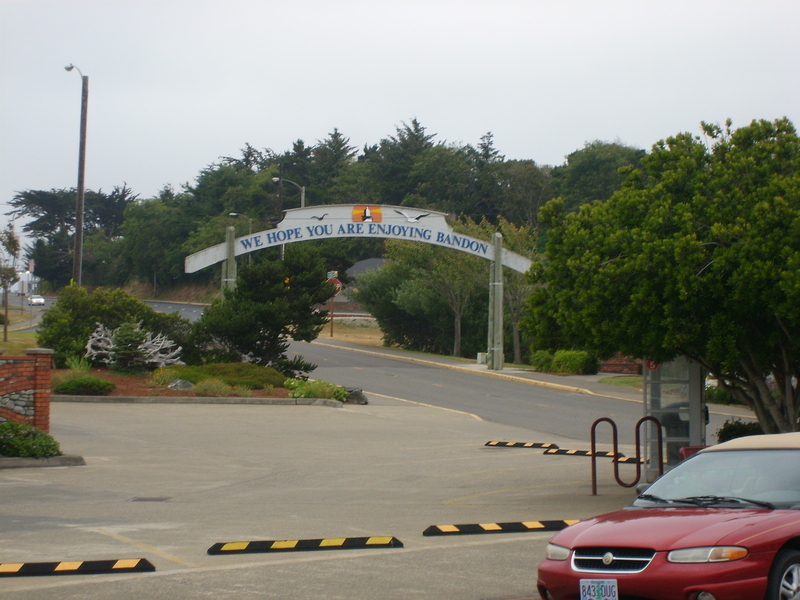 My mother, husband and I decided to take a trip down the Oregon coast to Bandon, as my mother had never been there, and my husband and I love going to the game park. As we drove down the 101 via Florence, the weather suddenly went from warm and sunny to dark, cold and foggy exactly as we passed by a ‘Misty Lane’. Nevertheless we got out for a few minutes to look at the beach, see a lighthouse, and examine some berries. I had no idea what they were, but they were a pretty colored and looked delicious, so I put some in my mouth. 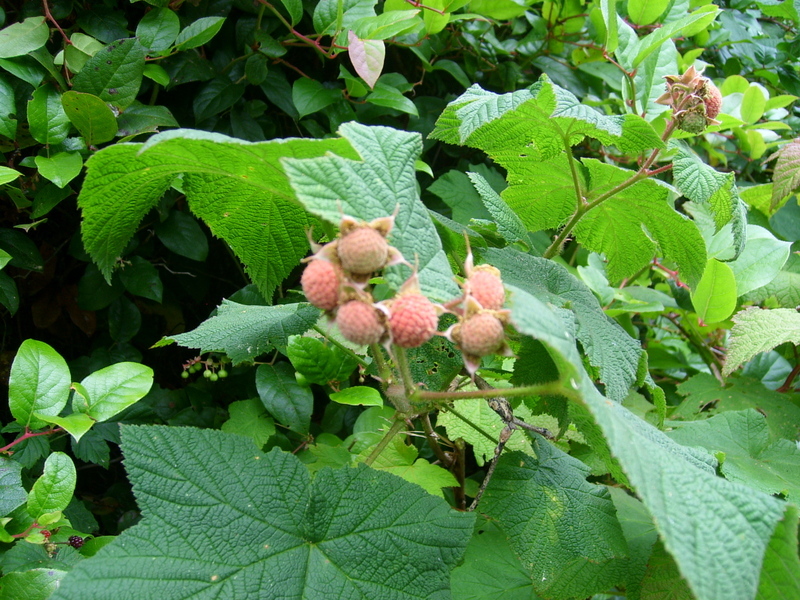 And they were great, similar to raspberries but with more seeds. Only moments later a ranger passed by, and slowed down for us. A brief moment of remorse (and a possible need for an ambulance) made me decide to check with him to find out what they were. He couldn’t tell me the name, but was positive that they were edible. We looked for a few more, after a short chat with the ranger. There weren’t many ripe ones though, so our harvest was minimal. (I did look up later what they were. Turns out they’re something called Thimbleberries. Related to blackberries, raspberries and such. I also discovered that black colored berries are usually fine to eat, but red berries only occasionally. So there goes my theory of “if they look delicious, they must be edible”.) 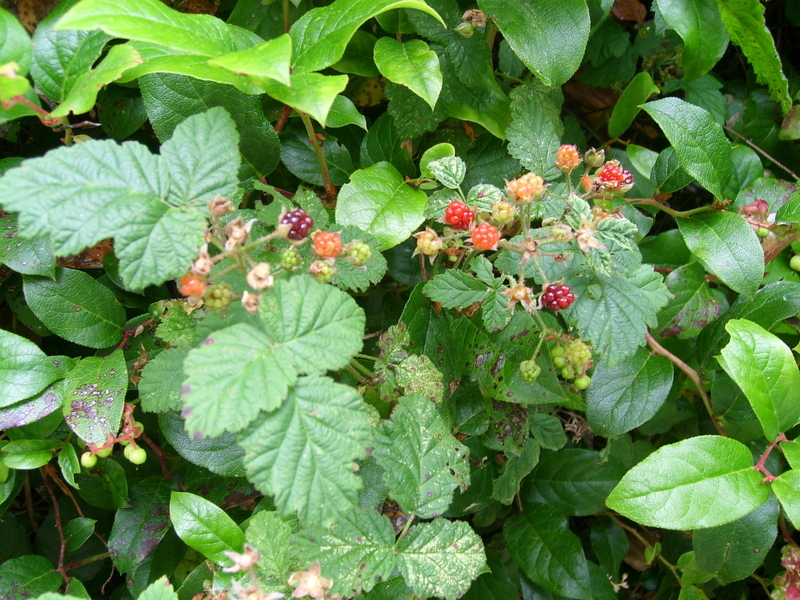 There were also blackberries, but of course we’re a week or two too early for those. The rare black ones were too tart for my liking. Our most exciting find was a beautiful ripe salmonberry. I would’ve taken a photo of it, but I ate it. We stopped briefly in Coos Bay, where my husband lived as a child, and checked out an antiques store. I was surprised to find two small original Chiparus book stands, but being both broken and glued back together, I found them overpriced at 1,000. I’d rather buy a cheaper replica over a seriously damaged original. By the end of the afternoon we made it to the West Coast Game Park Safari in Bandon, where it was remarkably quiet. Just a few minutes of waiting took us into the ‘petting arena’ where we were allowed to hold, pet and play with two of the cutest little baby leopards. Truly adorable, and very friendly. 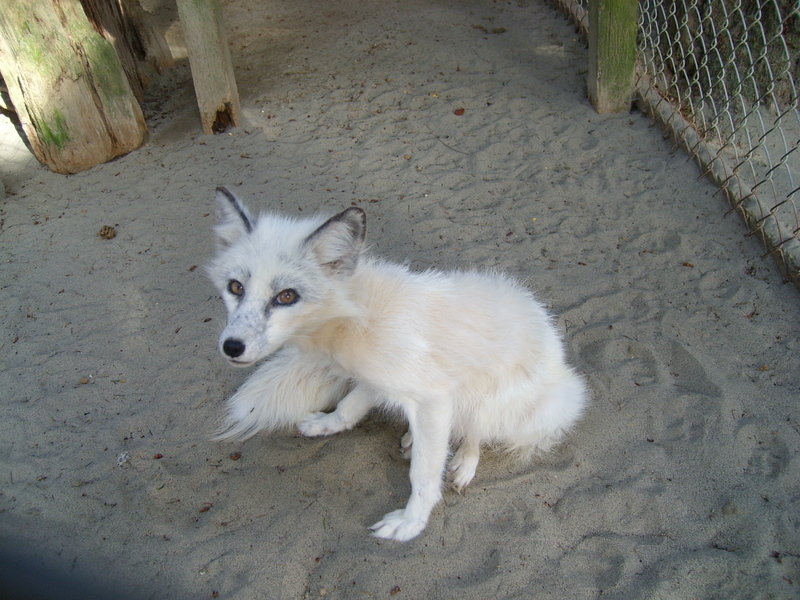 The zoo is a little depressing overall though, as the cages are small and bare with animals looking depressed and sad. The deer, which walk free throughout the park, have ratty fur perhaps from too much handling and stress. The large cats just have small cages with cement and wire fences, and pretty much nothing in them. They explained however that they do have breeding and training exchange programs with zoos across America, so apparently other zoos don’t mind sending their animals here. One of the best featurs of the game park, after being able to pet the cubs of leopards, lynxes, etc., is their nursery area. 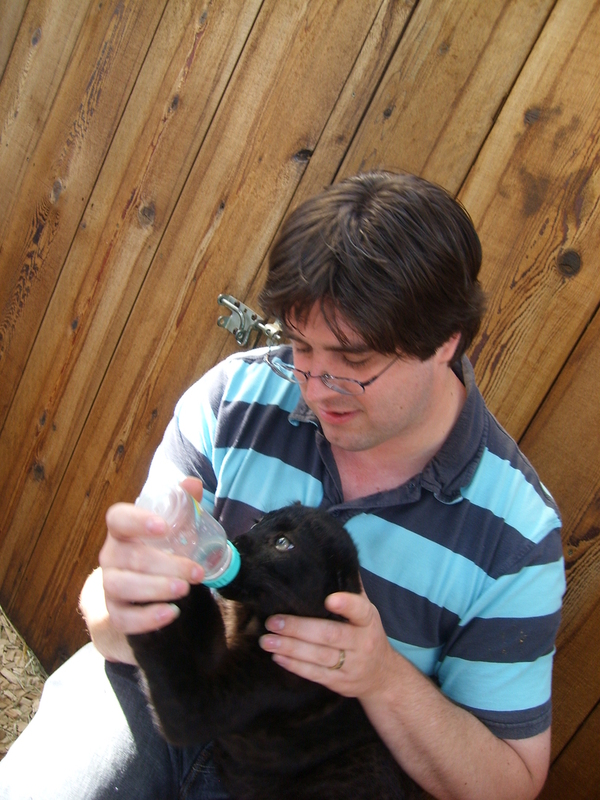 Every hour or so they bring out babies from the nursery, and let people hold them and pet them. In our case there was a cross eyed opossum (which yawned right into my face, with its enormous mouth and endless teeth), a tiny baby opossum. Nobody wanted to pet/hold the possums, they were all like: no thanks. So I ended up holding them for a long time. Americans apparently see them as disgusting nasty pests for the most part, and I felt sorry for the sweet baby who looked so adorable sleeping in his little sack, as I held him. 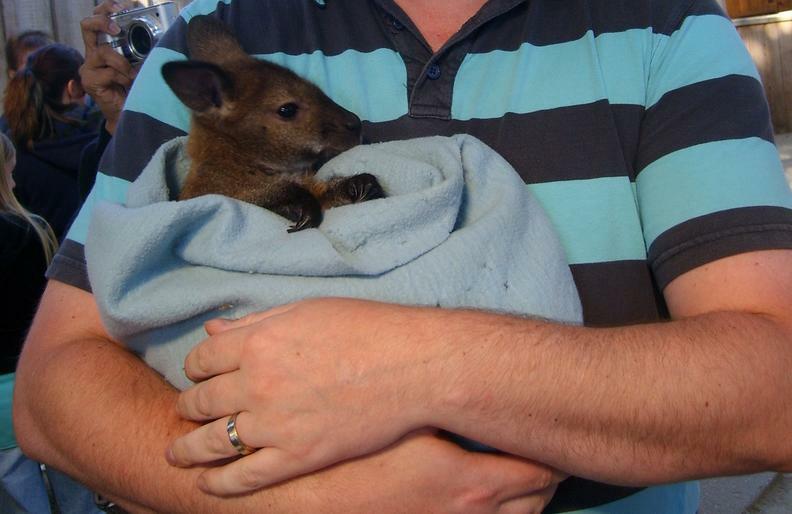 My husband held a baby wallaby, we both petted a cute white baby skunk, and some of my favorites were of course their two darling silver mitt ferrets. They were sleepy and shaking constantly as it was cold outside, and they had been sleeping in front of a heater. Such sweethearts. One of them had a face that was very similar to my sweet baby IJsbrand, who passed away a few months ago, so holding him made me miss my IJs a lot. I wish I could get another ferret for our girl ferret, who doesn’t care much about us, but then we’ll just endlessly be buying new ferrets. And if we get an older one, we’ll be out a fortune in medical costs again, and we’ll just lose him in only a few years. So eventually, last to leave, I said goodbye to the ferrets, now both in my arms, and went to find my husband and mother who had long since wandered off. We finished our day with a truly surprising and delectable meal at an Italian restaurant called ‘Alloro’ in Bandon, OR. I normally find that extensive time spent in Italy has spoiled me too much for ‘American Italian’. Yet after seeing their menu online, I began to suspect that this might, at last, be an authentic Italian restaurant (Fairly Tuscan, to be more precise). Well beyond anything I might find at the so called “great, totally authentic Italian” restaurants people seem to blindly praise in Eugene. I even dared take my mother there, who I would normally be too ashamed to take into an American Italian restaurant. The restaurant had only 5 tables for some reason, and two small booths in the back. The rest was just empty space, which guaranteed plenty of privacy and a calming atmosphere. On the other hand, the emptiness did not do much for the accoustics, which became a little problematic by the time the 8 middle aged golfers at the other table (presumably staying at the expensive Bandon Dunes Golf Resort), had become drunk and kept hitting on the 16 year old waitresses. (Real classy) I wondered whether the lack of tables was to disguise a meager clientele (by no means as a result of their food, but it was mid summer and freezing cold, with nothing to do in Bandon), or whether there were so few tables to give the impression that the restaurant is rather selective and elite. (Their web site did lead us to believe that reservations are always necessary). I enjoyed a selection of Italian cheeses (My best guess: Two seemed to be pecorinos, a younger and older, one cheese I swear to god was a 3 month old Dutch Gouda, one was a slightly aged gorgonzola piccante, and the third one was a washed rind very soft yet robustly flavored goat’s cheese). The cheeses were served with a nice fresh ciabatta type bread as well as some multigrain, also very fresh. My husband had crispy calamari with a spicy tomato sauce, and my mother opted for the clams if I recall correctly (I don’t care for them, so I didn’t try them), though she was terribly disappointed that the stuffed zucchini flowers had shrimp in them, as she has sadly developed an allergy to her beloved crustaceans in recent years. For my main course I enjoyed an unusual halibut ravioli in pesto. The choice of halibut was new to me, but unlike I had feared, the filling was not at all chunky or overly fishy, but rather soft, white (mixed with ricotta?) and lightly fishy so that it tasted just right. The pesto wasn’t my favorite choice with a fishy filling, and it was fairly unremarkably, though certainly no different from your average basil pesto in Italy. I wondered if a lemony artichoke pesto might not have been a better pairing. The portions were normal, primo piatto sized, the way they should be. (Appetizers were a bit large, easily shared) If one shared an appetizer, and each picked one primo piatto, you would have plenty of space for a secondo piatto of meat or fish. We just went straight on to dessert and coffee though. For the dessert we shared a combination of chocolate cake with a chocolate sauce filling, chocolate sauce on top, two little scoops of vanilla ice cream, and outstanding hazelnut meringues with real little pieces of hazelnut. Truly a remarkable meal, and one that could easily hold its own in competition with a good quality Italian restaurant! And for three people (three appetizers, three pasta dishes, a side dish (perfect green beans wrapped in prosciutto), one large dessert, several glasses of wine, coffee with liquor and regular coffees) we paid $130 ($43 each or so), which I found well beyond reasonable. Astonishingly, the pasta dishes were only around $10 each. So I hereby wholeheartedly endorse Alloro as serving the most authentic Italian food (or at least Tuscan, I can’t speak for all of Italy) in all of Oregon, and possibly the United States in my experience thus far. 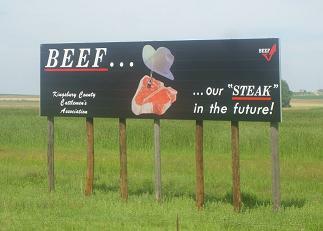 Beef: Your steak in the future? Tonight my husband decided to get in touch with his more primitive inner man by grilling enormous pieces of meat over open fire. As someone who rarely cooks things like steak or other large chunks of animal product, I was amazed at the prices of beef. The prices of meat in the supermarket bring me back to a question that has been floating around in my head for several months, ever since I first ate at Bates’ Steakhouse. Is it reasonable for a place like Bates Steakhouse in Eugene to charge $30 for this same pound of rib eye (taking into consideration that they also get wholesale discounts)? Going by retail prices, I would say $10-20 for 6-8 ounces of Filet Mignon with a side is quite reasonable. But $30 for some not particularly great meat? Even more surprising are their prices for some plain old Fettucine Alfredo (A sauce that in my many years of regular Italy trips I have never encountered in that country). $18?? Cost of ingredients: Probably $2. And how about $3 for blue cheese crumbles? And $5 for a bread basket that I would expect to be complimentary? Even in Italy the infamous ‘pane e coperto’ is usually only E. 1.50 or so. God knows what they spend the rest of the money on, because it isn’t the decor of the restaurant. The atmosphere is less than inviting; resembling someone’s old Eugene house, only without that charming homey feeling, and with the cold sneer of a pretentiously priced cowboy-theme menu. Friends seem to share my amazement at their prices. And here’s what really breaks my wooden shoe, as we say in Dutch: I just received a very amateurish newsletter that looked like your latest community letter (only crappier), advertising Bates’ great new steak deals. And what do I find on the inside of the newsletter? A list of their customers who are celebrating their birthdays or anniversaries. Saps like me, who filled out the comment card and now get their information sent out around the city. Is it just me, or is this a grossly inappropriate invasion of privacy? Publishing my name and birthday/anniversary without my permission, for advertising purposes (“Look at all these people who are loving customers”) ??? As my accountant once told me: “New restaurants are the worst business to get into. They are opened a dime a dozen, but 95% of these clients comes back to close down their business within 3 years.” So it will probably be with Bates. But perhaps I just don’t appreciated grilled meat enough.